“The summer that I spent as a CBCF intern was the most rewarding time of my life. The Foundation’s internship program was, and still is, an outstanding opportunity for young, African-American men and women to experience Capitol Hill. In addition to the camaraderie of interacting with dozens of other highly-accomplished students from around the country, interns are given a first-hand view of highly-accomplished students from around the country, interns are given a first-hand view of some of the most powerful elected officials in the democratic world. Dshawna Bernard, SPA/BA ‘10, beams when she talks about her fall 2009 internship at the Congressional Black Caucus Foundation (CBCF), a public policy and research institute focused on socioeconomic equality for African Americans. Political science and minoring in international studies, almost missed out on this chance. After a friend recommended she apply for an internship at the foundation, Bernard discovered the deadline was looming. “I literally had three days to get everything done,” she said. “I didn’t know if I had time.” Bernard almost gave up, but thanks to encouragement from her mother and friends, she finished the application. When she received an e-mail from the foundation weeks later, she was hesitant to open it, fearing the worst. But to her surprise and delight, she had been accepted into the internship program. The internship would have been a hard one to turn down. It includes housing downtown, a small stipend, opportunities to attend receptions and meet speakers, and a leadership retreat. The work itself has also been challenging and allows Bernard to engage in research and writing projects. But other opportunities still lay ahead. CBCF’s president, Dr. Elsie L. Scott, needed someone to assist her during the foundation’s Annual Legislative Conference last September. A public relations representative from the foundation who was familiar with Bernard’s work recommended her for the position. Shortly after applying, Bernard was chosen to shadow and assist Dr. Scott throughout the conference. Quentin James is currently a senior at Howard University double-majoring in African American Studies and Political Science. Quentin was intern in the CBCF’s Emerging Leaders Internship Program sponsored by Walmart in the spring of 2009. During his tenure in our program he was placed in the Office of Rep. Carolyn Kilpatrick (MI-13). Currently, he is an associate with the Generational Alliance, a Washington, (MI-13). 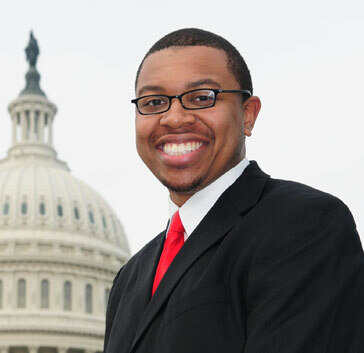 Currently, he is an associate with the Generational Alliance, a Washington, DC based coalition. “Many months ago I asked each of you to help support me and my efforts of joining the NAACP Board of Directors to bring change. Well, that day has finally come. Yesterday in New York, I was officially sworn in as the second youngest member of the NAACP Board. And with that change so many more are in the works. At the meeting we elected the youngest and only the fourth woman to be chair of our board, Ms. Roslyn Brock. Here is a story where you can read more: http://www.nytimes.com/2010/02/21/us/21NAACP.html. Also, I was elected Vice-Chair of the NAACP Advocacy and Public Policy Committee which oversees all of the policy and advocacy positions of the NAACP. This committee is chaired by Lorraine Miller, the current and first African American Clerk of the US House of Representatives. “In 1979, I had the opportunity to join the second class of CBCF Interns. Still in its infancy, the focus of the program was similar to what is now known as the CBCF Congressional Fellows Program as each intern had completed graduate school. We were placed with House or Senate Committees or Subcommittees whose goal was to provide a clear pathway to Subcommittees whose goal was to provide a clear pathway to increase the number of minorities on the professional committee staff in the U.S. House and Senate. I had just completed a Masters in Public Administration and was assigned to the (then) House Education and Labor Committee. Through my CBCF internship, I learned about the jurisdiction of various House Committees, the legislative referral process and how to organize hearings and conduct oversight responsibilities. I was able to work directly with members of the Education and Labor Committee and their staff, including CBC Members staff. This exposure to both members of Congress and other professionals helped me better understand the people involved with and environment in which legislation is negotiated and the role of coalition building in making a case for legislative action.